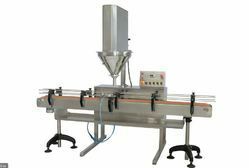 We offer a wide range of high quality Filling Machines to our valuable customers. 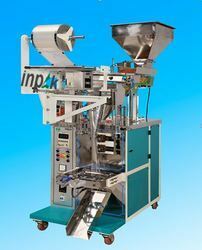 Offered product range comprises of Linear Weightier Vertical Packing Systems, Semi Automatic Granule Filling Machines and Granule Filling Machines. These machines are highly demanded for their optimum performance and low maintenance. Being one of the leading manufacturers and suppliers of these Fully Automatic Liquid Filling Machines, we never compromise with its quality. Thus, we engage in using of the finest raw materials that are available in the market. 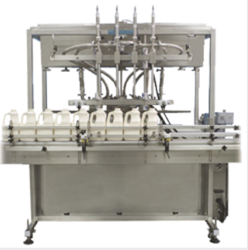 These machines find their applications in industries concerned with the packaging of liquids. The offered machine’s functionality and market leading pricing make it one of the first choices in the market. We are looking for queries for Fully Automatic Liquid Filling Machine from Coimbatore , Tamil Nadu, Kerala, Karnataka & Andhra Pradesh. 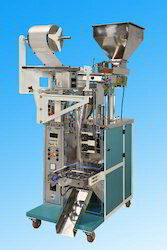 The Basic Range Vertical Form Fill Seal bagging machine is a mid-range machine designed for filling and sealing laminate film bags for a variety of product types. This machine comes with a printer and single forming set (made to size requirement) as standard and is the ideal machine for packing both food and non-food items due to its robust stainless steel construction. Complete with a 5.7" touch screen control panel for ease of use and a large range of optional extras, this vertical form fill seal packaging machine is an ideal starting point for most standard sized applications. Jaws for sealing polythene film bags can be purchased separately for this machine. 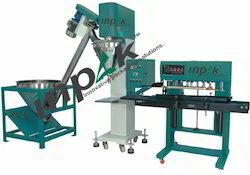 The Inpak vertical form fill and seal machine series Flexi Bag 300 and 400 can produce pilow, gusseted, standup and stable pouches. The jaw movement is achieved by a digitally controlled pneumatic or AC Servo Motor. The Flexibag machines are ideal when multiple number of SKU’s are to be packed on a single machine - at speeds up to 90 filled-bags/min. Our modular design platform allows for solutions at different price points while ensuring upgradability whenever your production requirements demand it. Pneumatically or Servo motor operated cross seal jaws. Pulling belts driven by AC servo motor and universal joints. Industrial PC, color touch screen. Capacity to program Data for 100 items. Machine functions integrated in the screen. Automatic detection of faults in the sealing temperatures and air pressure of the machine, guaranteeing a good seal each time. Key controlled Access to different operator level. Automatic detection for the end of film roll. Motorized centering of film roll holders. Easy interface with peripheral equipment. Designed and manufactured in accordance with Safety regulations. Height of Collection Pouch from floor** 360 mm to 910 mm..
* Depends on Material, Filling Range. ** We can supply as per customer requirements. *** With help of change parts. We are an organization which is well known in the business sector for the assembling and supply of an incredible scope of Packing Machine which have an amazing outline and they are high on interest in the business for their unrivaled execution. Our items have been made utilizing a high caliber of crude materials and they have been valued at extremely sensible rates in the business. Our items have been evaluated at extremely sensible and moderate rates in the business. Owing to the high quality raw materials and modern machinery used in its making, the offered Automatic Granule Filling Machine are amongst the finest that are available in the market. Priced reasonably, they have a high demand in the market. Used diversely for packaging purposes, the offered machines have an impeccable functionality. For the purpose of providing the best to our clients we manufacture these Double Head Powder Filling Machine using the finest raw materials that are available. Offered to clients at a market leading price, its demand amongst our clients is quite high. Used in a number of industries engaged in packaging of various granular products at a fast rate, their demand in the market is quite high. Backed with know-how and comprehension in this domain, we are counted amongst the foremost company in this industry and offering quality assured range Jar Filling Machine. 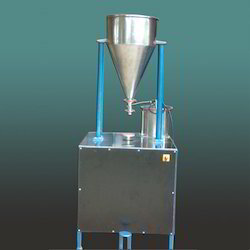 This Jar Filling Machine is precisely designed and made at highly developed production unit by making use of superior quality material and advanced machines in compliance with the industrial quality norms. To meet the requirements of our precious patrons, we offer this product in best packaging and deliver the same in committed time frame. We are one of the prominent names to offer a wide array of Jar Filling Machine that is highly appreciated and demanded by our clients. We are one of the few names that is involved in the manufacturing, supplying and exporting of supreme quality Powder Filling Machine. Characterized by a sturdy stainless steel construction, these machines are durable and provide optimal performance to the customers. 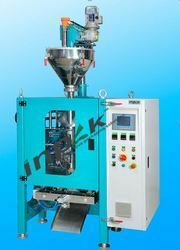 We are looking for queries for Powder Filling Machine from Coimbatore , Tamil Nadu, Kerala, Karnataka & Andhra Pradesh. We are a most trusted name among the topmost companies in this business, involved in offering Semi Automatic Pickle Filling Machine. 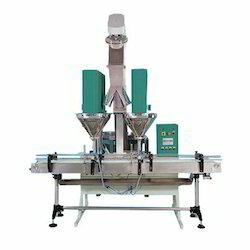 Single head automatic pickle filling machine. 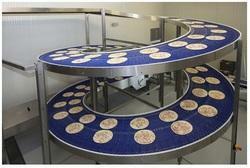 You will get turn table and conveyor, one head pickle filling machine. Use food grade material. The heavy duty,single head piston liquid filler for all types of liquids, creams,pastes, gels, etc. containing particulate matter up to 7i8 in diameter. Volumes dispensed can range from 200 to 1OOOml per cycle, depending on model selected. 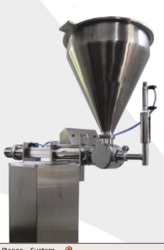 During a filling cycle, the product piston travels back to draw product from the hopper into a precision machined cylinder, then extends forward to fill Product is dispensed into the bag or container through a filling nozzle and/or cutoff device. It is widely used for batter filling and optional of milk, oil,ointment. shampoo,juice,liquor, perfume, wine,food product filling - in Bag, Jar. Can, Vial,Bottle, Tub & any Containers. The unit can be quickly dismantled for the maintenance just by opening front cover. Easy way to dean Each and every part can be attended for cleaning operation of maintenance without any hinderance. S.S. 304 elegantly matt finished body. A unit to fill variety of Liquid and can be used for various type of bag or containers. Minimum change over lime from one size to another container or fill size. Filling Accuracy .5 to 1% Filling accuracy on single dose Depends of the nature of liquid. 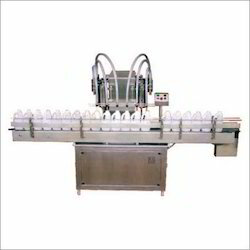 Being quality oriented organization, we offer Packaged Drinking Water Filling Machine to our prestigious consumers. Product-array, made available by us has longer service life as it is made by making use of premium quality material. Furthermore, it is provided with the unique features, which are completely based on the requirements of our clients. We have an experienced team of quality controllers, who are well-versed with the industrial standards that are used for the precise finishing of this Packaged Drinking Water Filling Machine. We are committed for the time frame delivery at our client’s doors. Spiral Conveyor System offered finds use for handling goods movement involving floor to floor handling as well as in specific directions including from top to bottom and from bottom to top.Some of its features include can handle different support processes like stirring, mixing, heating and cooling operations at time of conveying.